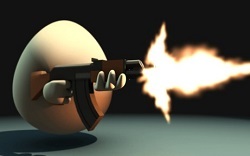 Play Shell Shockers (Shellshock.io) for a chance of being a hostile egg killer! Pick your favorite class before jumping into the arena full of egg killers directed by other real human players. Arm yourself with dangerous weapons, such as Scramble Shotgun, EggK47 then use them wisely to battle against others. You move around the map trying to hunt down the enemies, kill them quickly when they get in your sight while protecting yourself against from their attacks. You should beware of the amount of your ammo since the weapon only has a restricted supply. Hence, you are supposed to gather more supplies scattered over the ground, or you can collect them from dead rivals. In Shellshock.io, you have to always observe the surroundings because you have no idea when the enemies attack and crack you. Show no mercy to everyone! You must fight for the top spot on the leaderboard, which gives you a chance to become the best egg killer! Control your character using WASD or mouse. Click LMB to fire, switch weapons with key E, use key R for reloading, throw a grenade with key Q. What's your idea of Shellshock.io?